A new exhibition Malevich. Beyond the canvas opened at Second Floor Art Center in Ukraine’s presidential administration on November 11. The exhibition is devoted to Kazimir Malevich – one of the most famous Ukrainian artists in the world. Malevich. Beyond the canvas is the sixth art exhibition at Second Floor Art Center since its foundation in April 2015. It features 16 images that pull artistic simplicity and complex ecosystems together. The simple figures depict an incredible Universe of Kazimir Malevich. “Our main goal is to understand the nature of Suprematism. You can see an absolutely different picture, depending on the angle you are looking at it. You will see new solar systems and the brand new Universe! Kazimir Malevich gave a great impetus so we could become real Creators,” said Gennadiy Kurochka, author of the project and co-founder of Ukraine Crisis Media Center. Kazimir Malevich is one of the most important personalities of the twentieth century who had fundamentally reshaped fine arts, architecture and design. His works were a watershed in the history of art, separating it on “before” and “after” era. Malevich’s Black Square is one of most renowned paintings that heralded the beginning of Suprematist art. He thought the artist had to delve inspiration in his own creative self and not merely copy the outside world. The exhibition highlights the artist’s Ukrainian legacy and restores historic justice. Most reputable researchers of Kazimir Malevich stressed that Ukrainian culture influenced his avant-garde paintings to a much greater degree, which was reinforced by Kazimir Malevich’s own texts discovered recently. “Even the traditional Russian principle of sharing the other’s heritage did not work with Malevich. They did not try to share his legacy but to appropriate it altogether. This will not happen. We are discovering a Ukrainian Malevich step by step, illuminating new pages of history that were overlooked. Why his works were gray and colorless during his stay in Russia, yet gained brightness with a full palette of colors when he was in Ukraine? It is easy: he became bright when returned to Ukraine,” said Dmytro Gorbachov, historian of art and a long-time researcher of Malevich’s art. “Although Malevich is regarded as one of most influential artists of the twentieth century, there is no Art Museum devoted to his works. We are discussing the idea of first Kazimir Malevich interactive museum. 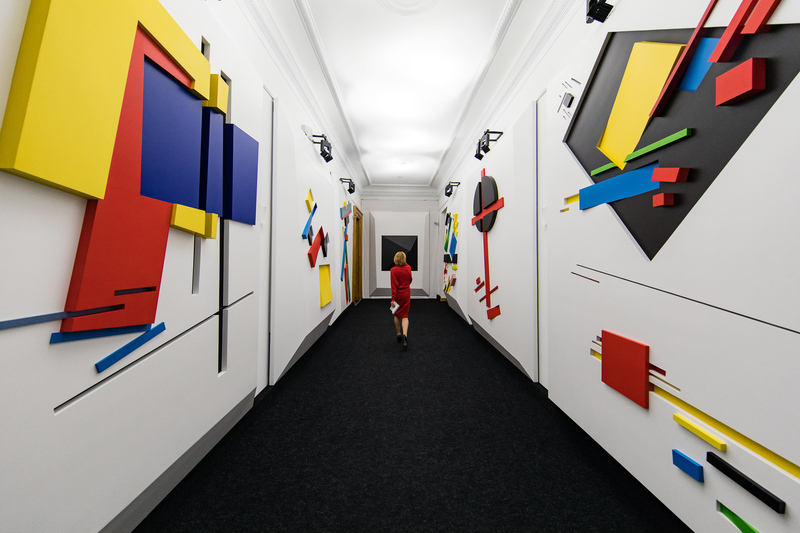 The Malevich Institute project would unite three places – Malevich Museum, Ukrainian avant-garde research center and an experimental lab of contemporary art. We really hope the government would support such a project,” commented art historian Tetiana Filevska. Malevich. Beyond the canvas will be exhibited at the presidential administration for three months. Anyone who wants to immerse themselves in the world of the Ukrainian artist can join the tour or look at it online. Previous Second Floor Art Center’s exhibitions are promoting the new Ukraine globally, traveling across Ukrainian embassies worldwide.